Can love be sent across the ages? Can strength and healing be sent back in time? Something has happened this week that’s made me desperately want this to be possible. Having just dipped my toes into the whole genealogy thing, looking at my family mainly from their time in the late 1800s in Donegal, their move to Glasgow and subsequent generations, has been a revelation. By what seems sheer chance I’ve been put in contact with a cousin I never new I had (hi John!) – a grandson of my grandfather’s sister. It seems the genealogy bug had also hit John and he’s amassed an amazing amount of information, but one episode stands out and is particularly heartbreaking. My grandfather Thomas was the eldest in the family. By the time he married my grandma in 1917 his youngest siblings were still young. 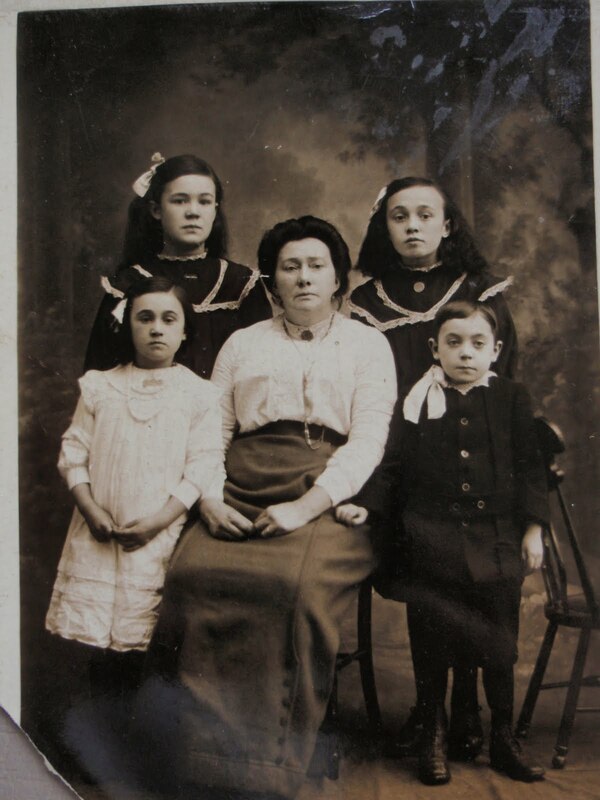 His mother had died and soon afterwards his father died leaving Bridget (11) and young John (10) as orphans – that’s them in the photograph below with my great grandmother Margaret Gallen, Sarah and Mary at the back, and in the front row, Bridget and John. From what we can see of the documents my grandparents applied for some relief to the responsible body, saying they were happy to have the children with them but they would need some help as their total earnings were little more than two pounds a week – not much to house, clothe and feed five people, as a baby had appeared by then. It seems the request for relief was refused and the children were taken and sent to the poor house. Not much is known after that bar a few notes on the official documents that John found (and wisely advised my sister and I not to read them at work). On Bridget there isn’t much. Some papers later say that she bore a male child in 1929 at Stobhill Hospital. There is a record that he was baptised but no name and no birth certificate found as yet, and certainly no marriage certificate – she was still listed as McGinty, our family name. On John, when he was admitted he was diagnosed as being ‘mentally defective’ and ‘feebleminded’. This poor wee boy who’d lost his parents and now was taken away from the rest of his family – even his sister. Of what happened to them later, John seemed to catch TB and was discharged from hospital back to the guardianship of the state as a ‘mentally deficient’ in 1925 and he died in 1940 at the age of 32 of ‘acute pleurisy and myocardial insufficiency’. We don’t know as yet what became of Bridget. The thing is. I knew I had photos of John and Bridget and this weekend I searched them out as they were pics of them as adults. I’d looked at them before with interest but now, knowing their story, well, quite a few tears were shed. There were photos of them as adults, but I also discovered some of them as children too and I just wanted to grab them and take care of them myself, but all I could do was a bit of useless weeping. So, if by some miracle of deity or science there is a way of sending love and comfort to two little children over the distance and time back to 1917 at 61 Oran Street, Maryhill, Glasgow, then please do that.